Welcome to Cindy Freland’s store! 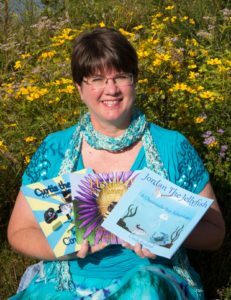 Cindy is an international author specializing in children’s books about the Chesapeake Bay and surrounding areas. Help your children learn to read and discover more about the Chesapeake Bay through her books! The day it all started was a brilliant summer day in 2013 at Breezy Point Beach where I observed so many jellyfish. On my way home, I thought about how Andrea (one of my daughters) was stung by a jellyfish years earlier at Sandy Point State Park. That was when I decided to start writing my first children’s story, Jordan the Jellyfish, in the Chesapeake Bay Adventure series.